Mulch really is a gardener’s best friend. There is no better way to keep weeds from becoming established than to keep the bare earth surrounding your plantings covered. It also lends enormous interest and beauty to the overall look of your landscape. Mulch is so much more than just pleasing to the eye. But beyond it’s aesthetically pleasing appearance and weed suppressing abilities,it promotes healthy and strong plant growth in more ways than you think. Mulch is an incredible soil insulator. It can help to keep the scorching-hot summer sun from overheating the soil. On the flip side, it also retains heat on nights when the thermometer dips down too low. Those regulated temps allow the root systems of plants, shrubs and trees to avoid the damaging stress that extreme hot and cold swings can cause. The benefits don’t stop there. Mulch helps you water less by protecting the soil from drying out too fast. And when it rains too hard or too often, that same covering can help to shed off a bit of the excess moisture. Last but certainly not least, over time, mulch can add valuable nutrients to your growing soil as it breaks down. The real key is in selecting the best mulch to use in your flowerbeds, garden and surrounding landscape. The choices are nearly endless, and can actually be somewhat overwhelming. Shredded bark, wood chips, pine chips, cypress, dyed, straw, shredded leaves, rock, and synthetic rubber mulches are just a few of the hundreds of choices available. The right choice really depends on the application. Mulching around trees and shrubs is more than just pleasing to the eye. As noted above, mulching is a big help when it comes to moisture and soil temperature regulation. These are both extremely important to the long-term health of trees and shrubs. Bark, larger-style wood chip products, and even stone or pebbles are great choices for these areas. They provide good insulation and weed suppression qualities, while breaking down slowly over time. If you use a stone-based product, it’s a good idea to first put down a breathable and permeable weed barrier. Without it, the rocks can work their way into the soil over time, and weeding can become an issue. When it comes to the garden, organic and natural is a great way to go. Not only are they safe to use around the plants that are producing your food, they also enrich your garden soil quickly. For mulching directly around plants, compost, shredded leaves, grass clippings or straw will all help to keep weeds at bay and plants thriving. They also break down quickly each season, adding back the much-needed nutrients that vegetable plants can quickly take from the soil. Wood chips and bark products are great for walkways and paths in the garden – but avoid using them directly around vegetable plants. They can do more harm than good when it comes to soil PH. 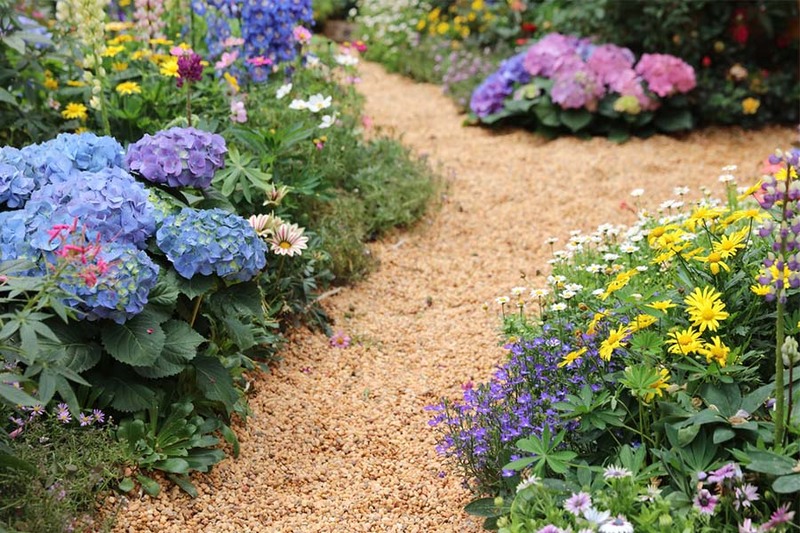 When it comes to flowerbeds, there are a lot of choices for the home gardener. Shredded wood based products are by far the most commonly available, and can range from finely shredded to large nuggets and chunks. Shredded hardwoods do a nice job of adding back organic material to the soil as they break down. Be aware that the more finely shredded you choose, the quicker it will disappear. That is not necessarily a bad thing. This will add nutrients to your soil quicker, but you will need to apply it more often. As an alternative, consider using low-growing ground crops as well as a living mulch in these beds. Perennials like Pachysandra, phlox or ground ivy can quickly grow a thick living mulch around larger perennials, shrubs and bushes. Not only do they add interest, but they can be an inexpensive, all natural alternative. When it comes to walkways and pathways, it’s all about choosing low maintenance mulches. Because there are no issues with creating plant vitality or building stronger soil, the sky is the limit. Gravel and stone-based products are among the best. Synthetic rubberized mulches will work here as well, although they can get pricey. Here again, putting down a barrier underneath to help prevent weeds and allow for drainage is a big key for easy, long-term care. Share Your Gardening Article With The World! Send us your gardening tip article! We want to know how you grow your favorite flowers, shrubs, vegetables and more! All you need to do is email us today at info@thisismygarden.com. You can also use our “Feature My Garden Tip” button at the top of the website for your entry. Help make This Is My Garden the best garden site around and share your garden knowledge with fellow gardeners! Ooops! The link to the article on sweet corn actually takes me back to the article on mulch. So sorry Gail! I will fix!